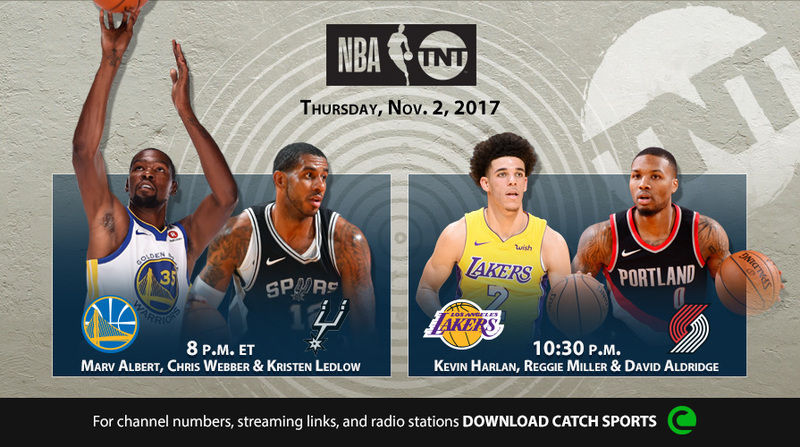 TNT’s NBA regular season coverage will continue Thursday, Nov. 2, with the defending NBA Champion Golden State Warriors in action against their Western Conference rivals, the San Antonio Spurs, at 8 p.m. ET. The Portland Trail Blazers will host the Los Angeles Lakers in the night's second game at 10:30 p.m.
Additionally, a special edition of Area 21 with Kevin Garnett will be highlighted by an all-female panel featuring some of basketball's most esteemed stars – WNBA legends Lindsay Whalen (a four-time league champion and six-time All-Star), Sue Bird (two-time champion and nine-time All-Star) and Cynthia Cooper (a four-time champion and two-time league MVP). Turner Sports reporter and host Ros Gold-Onwude will also join Area 21, with content running during TNT's studio coverage and throughout the night on Facebook and Twitter. • In Thursday's opening game - Warriors vs. Spurs - two of the Western Conference's elite teams will meet at 8 p.m. ET, featuring front court stars Kevin Durant and LaMarcus Aldridge. • In Thursday's second game, the young Lakers and rookie Lonzo Ball will visit the Trail Blazers and dynamic guard Damian Lillard at 10:30 p.m.